Over 10 million satisfied listeners every month. Compatible with iPhone and iPod touch. Requires iOS 9.0 or later. Our Android app is a fan favorite for jazz music streaming and now supports Chromecast. Requires Android 4.1 or higher. Enjoy the best jazz music on an app designed for your iPad and stream music on any AirPlay-capable devices. Requires iOS iOS 9.0 or later. 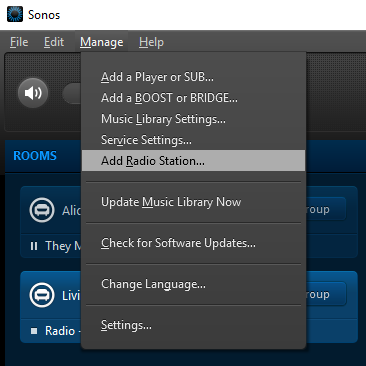 Open the Sonos Desktop Controller application on your Mac or PC (not the Sonos mobile app). Paste the URL from Step 2 above into the Streaming URL input box. Enter the channel name in the Station Name input box and click OK.
JAZZRADIO.com has a Squeezebox app to make streaming to your device easy. You'll need to create a Squeezebox account where you'll be able to add the app. Go to My Squeezebox and log in or create an account. Go to the Squeezebox App Gallery . Locate the JAZZRADIO.com App and click the Install button. Open the app and log in using your JAZZRADIO.com username and password. vTuner Compatiable Devices use a service called vTuner for registering your device and managing custom radio streams. Go to the site below for your brand of device and follow the instructions to sign up for an account and link your device. 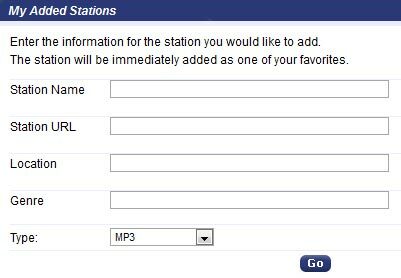 Navigate to the My Added Stations menu on the vTuner website and clink the button create a new station entry. Enter the URL from Step 2 into the Station URL input box. Fill in the remaining fields and click Go. On your device, the added channel will now be listed under the Favorite Broadcast Stations menu. Download and install the TuneIn App . Log into the TuneIn App with your TuneIn account. Scroll down and tap Add Custom Url. Paste the url copied from Step 2 and Save. First, you need to add the SHOUTcast Internet Radio channel to your Roku device from here. Next, locate the IP address of your Roku device and enter it below. If you have a Roku TV, go to Settings > System > About. For all other Roku devices, go to Settings > About from your Roku device (Settings > Player info from original Roku device). It should start playback on the Roku device, and you can then favorite it for later use. Denon devices use a service called Radio Denon vTuner. You'll need to sign up for an account and register your device through the Radio Denon service in order to add channels to your Denon device. Go to Radio Denon and follow the instructions to register your device and sign up for an account. Navigate to the My Added Stations menu on the Radio Denon vTuner website and clink the button create a new station entry. On your Denon device, the added channel will now be listed under the Favorite Broadcast Stations menu. Philips devices use a service called Club Philips, for which you need to register your device. Please use the following Philips Instructions for adding streams to your device. When prompted in Step #11, you'll need to enter the URL for channel using the steps below. WiFi Radio Frontier is a portal used to connect supported devices to Internet radio streams. Internet Radio > Station List > Help > Get Access Code. Next, you'll need to sign in or create an account on WiFi Radio Frontier . A) Enter the channel name from Step 4 into the Station Name input box. B) Paste the URL from Step 5 into the Station URL input box. C) Enter your country name into the Location input box. D) Click the blue arrow to save the channel. Your channel should now be listed on your device under Internet Radio > Station List. JAZZRADIO.com Premium members can use any third-party audio software that accepts custom streaming URLs or .pls / .m3u playlist files. Premium members can download the files that contain their unique Listen Key in the Player Settings. Our free iOS app supports AirPlay natively. The AirPlay icon will appear in the JAZZRADIO.com app when an AirPlay-capable device is on the same Wifi network as your iPhone/iPod/iPad. Anyone with the JAZZRADIO.com app and an AirPlay capable device can use this feature to stream our channels. Our free Android app supports Google Cast natively. The Google Cast icon will appear in the JAZZRADIO.com Android app when a Cast-enabled device is on the same WiFi network as your Android device. Anyone with the mobile app and a Cast-enabled device can use this feature to stream our channels.